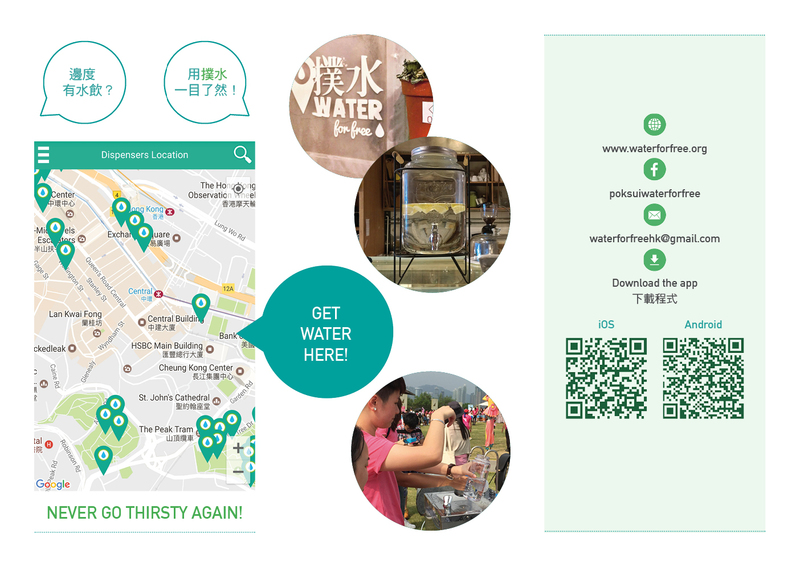 Water for Free is a mobile app (iPhone and Android) and website that shows the locations of public water fountains and dispensers throughout Hong Kong. It is an effort to reduce the vast amounts single-use beverage containers entering our landfills and oceans everyday. According to the 2011 Waste Statistics issued by the Environmental Protection Department (EPD), Hong Kong produces 100 tons of PET plastic waste daily. And the 2015 Waste Statistics shows a 36% increase. Everyday we dump 136 tones of PET plastic waste into the landfill. PET plastic is used primarily for single-use beverage bottles. Each bottle weighs about 25 grams and less than 4% is recycled. This means that we throw away over 5 million PET bottles per day. Instead of responsibly addressing the waste issue caused by their products, beverage companies spend huge amounts on advertising designed to convince us to buy ever more of their products. The fact that their products are filling up our landfills and killing wildlife – birds, fish and sea turtles eat broken pieces of plastic mistaking it for food – is not their problem. It is ours. So we are asking for your help, please use a reusable beverage bottles. 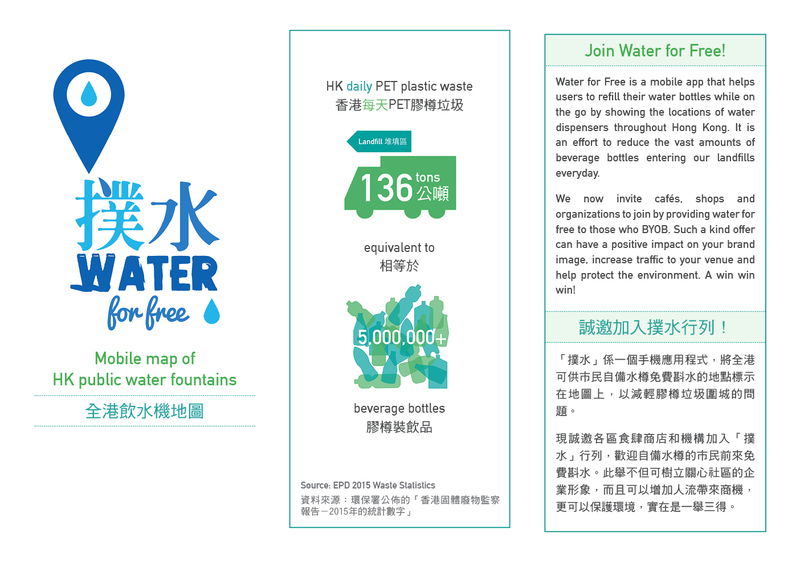 Water for Free is the latest effort of Go Green Hong Kong. GGHK was formed by regular folks that care deeply about the environment and want to take action. We believe that we all share one Earth and everyone needs to love it. Love is more than just words, it is practiced in everyday life. Please join us and lets take a step together towards a healthier future for ourselves and the planet. If you have any questions or suggestions, please email us at: waterforfreehk@gmail.com. Can you remind us of the list of chains whose branches will all give a water refill if asked? Then let’s promote and praise them, and put pressure on others to do the same. Great initiative, the amount of plastic containers being used just once is just senseless. I like the idea of paying people to return plastic bottles rather than reuse. I know it doesn’t stop people buying them in the first place but it just shows that offering people a few pennies will make them go the extra mile to do the right thing. Great initiative ! In Cambodia we are trying to get something similar of the ground ! Would be good if we support each other a little more to start a trend ! Thank you for your message Christ! I L O V E HK! nice dude, i like it. Technology + Environment = Apps for the future. A simple idea that could have a huge impact on the environment – clever! Very informative thanks for sharing this..